Showing results for tags 'aquaticlife'. 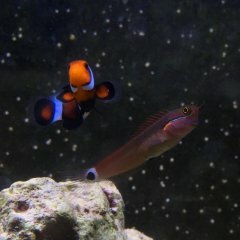 Hey guys, I've been incredibly busy with life the last few months with moving and work, that I wasn't able to focus too much on my reef keeping besides maintenance. Now that I am able to focus on it again, I have a question I am hoping someone more knowledgeable than me can help answer. I currently use a Aquatic life 115 Mini internal skimmer in my AIO sump of my DIY 25g tank. I have used it the past year. I would love to use some the better skimmers available, but because my tank's back chambers are only 2.9" wide clearance, I barely could fit the aquaticlife without basically forcing it down the chamber. I think this is causing some issues with the intake of the skimmer, since the intake is against the wall. I am thinking about a upgrade, since Im not happy with its performance lately, such as the skimmer not increasing production after a heavy feeding, giving clear tea-like skimmate, the bubbles are not fine enough and the foam head being small. I was looking at the Aquamaxx HOB 1.5 protein skimmer and wondered if that is considered a beneficial upgrade. I figured it must be since it would easily fit in the back chambers, and free up space there. I have an Aquaticlife 30" light fixture for sale. ( 29 1/2" long x 9 1/2 deep) It is actually two separate, 2 bulb fixtures attached as one large fixture for a total of 4 bulbs. Each fixture has its own on/off switch. I have the legs for rim mount and the hanging wires. Bulbs are 24" standard size which are actually 22.5" long. The fixtures can be separated with minimal work but I am selling them as one unit. Make me an offer......you pay shipping. Hello All, I've been struggling with GHA for the last few months. My tank is 11 months old. I thought perhaps my RODI filters or pre filters needed changed. I bought a TDS meter after changing light settings, feeding less, trying GFO. I have an RO Buddie. I depleted the DI cartridge from them an replaced it was another brand. This has been the only major change. I haven't tracked gallonage through it but carbon/sediment filters should be changed every 6 months and I've ordered those. Currently faucet TDS is 389 +/-. Current DI output it between 7-9. Could this low level of TDS be responsible for my algae? I am going to replace the carbon and sediment and see what the TDS is after the change. Any thoughts?